A couple of weeks ago I booked myself a trip to Nantes for the Pour L'Amour Du Fil textile show and exhibition in France. I can't tell you how excited I am! (and nervous! I'll be travelling alone, which I've never done and I've never been to France before! - I know it's embarrassing.) It's a textile show to celebrate 'the love of thread', with a focus on patchwork and embroidery which is organised by Quiltmania annually. My main reason for attending this year is to see the incredible work of Willyne Hammerstein, a Dutch quilter now hugely popular worldwide from the success of her book Milleifori Quilts, and the now infamous quilt 'La Passacaglia'. She will be there promoting her new book; Millefiori Quilt's 2, which is in stock at Sew and Quilt now! I'm pretty sure I am the first shop to stock it! They are flying out at the moment so be quick if you want one. Oh and while we're on the topic, we will be stocking La Passacaglia paper pieces to match the templates from the Millefiori book, they'll be arriving with us within the next couple of weeks, so watch this space! But more on that another time! I'm also visiting, as I'm dying to see Bill Volckening's collection of New York Beauty Quilts, this will be the first time the whole collection will be shown! I'm a regular reader of Bill's blog, WonkyWorldQuilts so I've long admired his fantastic collection of vintage quilts, so it will be brilliant to see some in the flesh. You know me and vintage quilts ;-) I'm booked in for a couple of workshops too, annnnd I'll be doing a little 'roving reporter' work for Love Patchwork & Quilting magazine while I'm there, I'll keep you posted on that. I feel like I have SO much to catch you all up on, but I can't even think where to start. There's alot of juggling at the moment! So here are some recent fabric eye candy purchases for you to enjoy while I sort myself out :-) These amazingly gorgeous bunch of fabrics above are from Fat Quarter Shop, a whole host of different one's I'll be mixing in with future quilty projects. 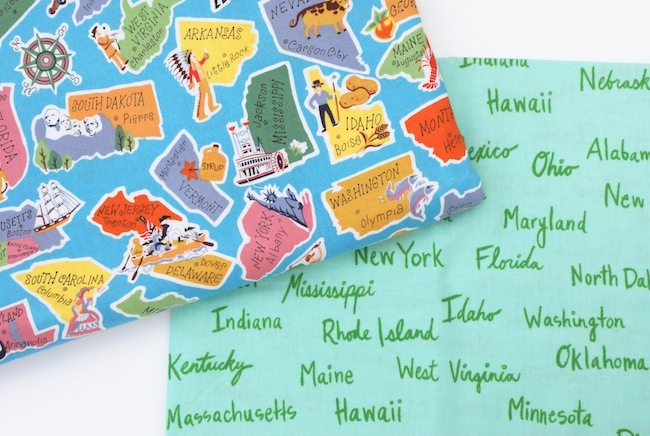 Including this fun text fabric from a new Cotton and Steel collection with the U.S. states printed. I looove all things Americana, and state related things :-) so it goes great with my other American state printed fabric by Michael Miller, which I've got about 2 yards of and hoarding until I find the perfect sewing bag/organiser project AND when I find the time to make it? I visited my sister in London a few weeks ago, and one of my first pit-stops was to Shaukat on Old Brompton Road. They have a huge selection of Liberty fabrics downstairs in their shop, so after a lot of open-mouthed gazing to the wares on offer, the staff pointed me in the direction of the off-cut piles - ideal for quilter's like us ;-) I also bought a 1/2m piece from the bolt of the top/left one above. I love the more muted colour's, so it was too good to miss. What an amazing trip you have planned! It will be even more magical/instructive/fun than you imagine. And I can't wait to her your tales of adventure! That sounds like an exciting and fun trip - looking forward to reading all about it when you return. 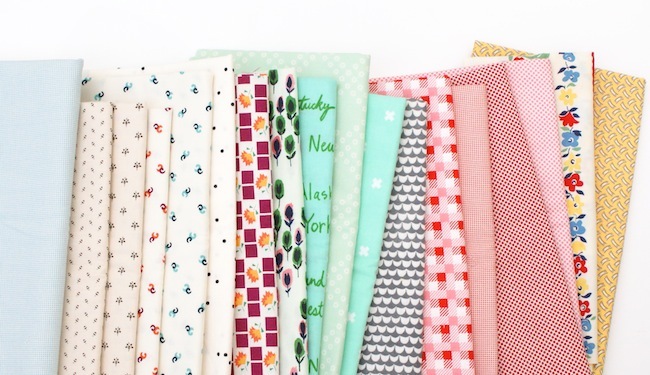 And oooh, that's a great fabric haul too! What an exciting trip - have fun! How fun to go to Paris ~ have a really lovely time! I've seen some of these Milleifori quilts being made and I so want to do one ~ so many things to make and so little time! Have a wonderful time! Can't wait to hear about it. By the way, I had some of that fabric with the U.S. states on it -- loved it! Some went into a baby quilt and I used some to make an apron for my husband. Have a fabulous time in Nantes, and while you're there look out for my fellow Aussie Irene Blanck who will be there with her new book from Quiltmania. Irene does The Most Amazing appliqué.